© 2014 by The York Daily Record/Sunday News. 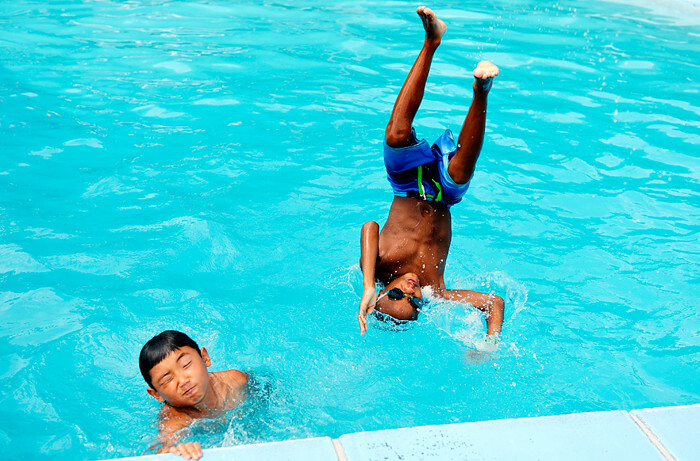 Gabe Sulpizio, 9 of Manchester Township, comes back up for air as Cameron Wright, 9 of Newcastle, Dela., dives into the pool at Summit Grove Camp in New Freedom on Wednesday, July 16, 2014. Camp Superkids, run by Johns Hopkins Bayview Medical Center at Summit Grove Camp in New Freedom, is now in its 23rd year. © 2014 by The York Daily Record/Sunday News. 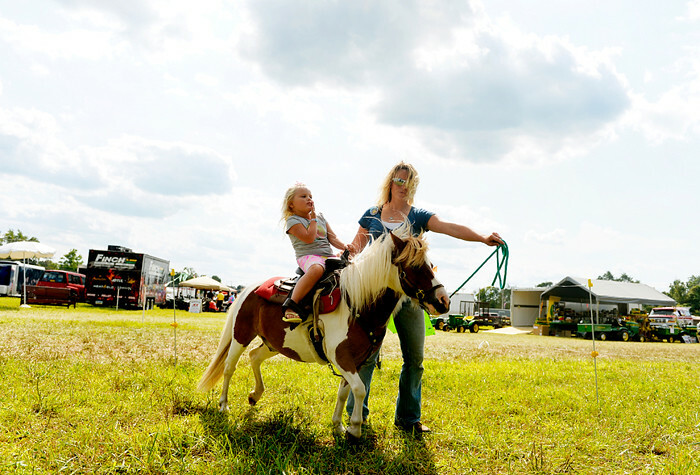 Led by Tiffany Berry of Conewago Township, Carly Knoedler, 4 of Jackson Township, rides Peanut the miniature horse at the 30th annual Olde Tyme Days in Conewago Township on Friday, Aug. 15, 2014. The annual show features historic power equipment, tractor pulls, a petting zoo and more. © 2014 by The York Daily Record/Sunday News. 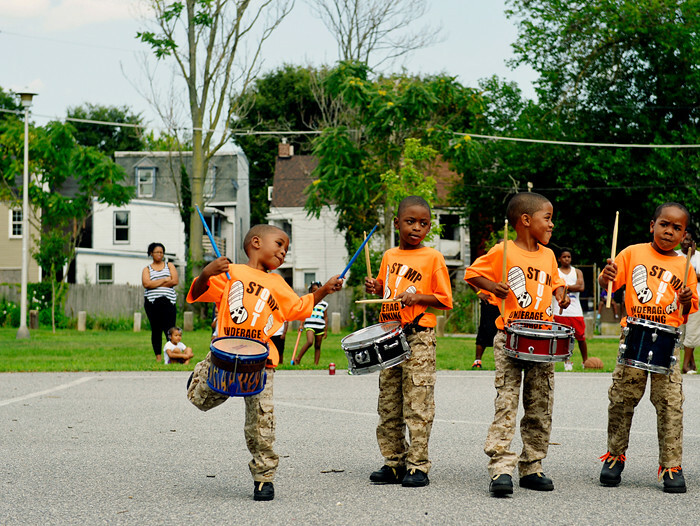 (Left to right) Temple Guard Drum Line members Reuben Beatty, 4; Quasen Hawkins, 5; Conrad Beatty, 5; and Mijiere Hillian, 7, perform at the third annual Codorus Street Reunion at Dr. Martin Luther King Jr. Memorial Park on Saturday, Aug. 9, 2014. The reunion, a celebration of the values and heritage of one of York’s first African-American neighborhoods, brings together descendants of families who moved from South Carolina to the neighborhood now marked by the park. © 2014 by The York Daily Record/Sunday News. Kendell Graham, 3 of Delta, gets ready to ride the Dragon Wagon with her sister Cambria, 5 of Delta, right, and Brooke Shrewsbury, 5 of Fawn Grove, left, at the Mason-Dixon Fair on Thursday, July 10, 2014. 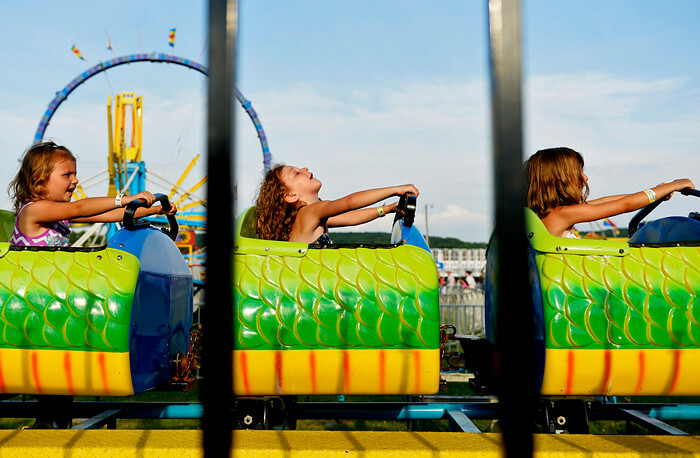 The 16th annual Mason-Dixon Fair, located on the Pennsylvania-Maryland line between Delta and Cardiff, runs through Saturday, July 12, 2014. © 2014 by The York Daily Record/Sunday News. 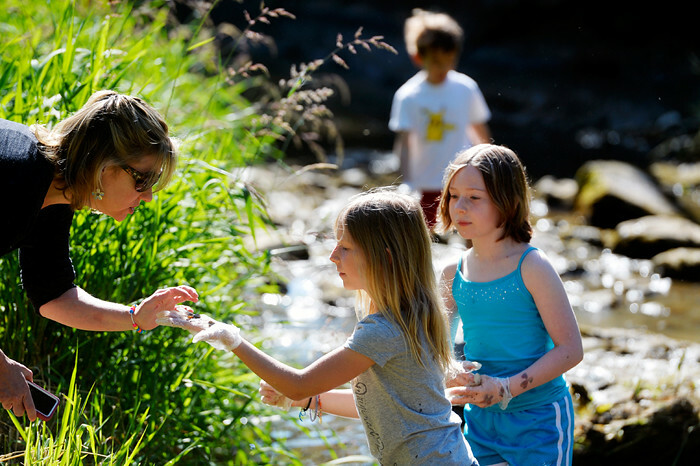 York Regional Academy Charter School second-grade student Claire Guschel hands a piece of trash to teacher Jennifer Reihm in Lincoln Park on Saturday, June 7, 2014. Second-grade students at York Regional Academy Charter School picked up litter at Lincoln Park along Roosevelt Avenue, as part of both their curriculum and York’s Litter Letter project. © 2014 by The York Daily Record/Sunday News. 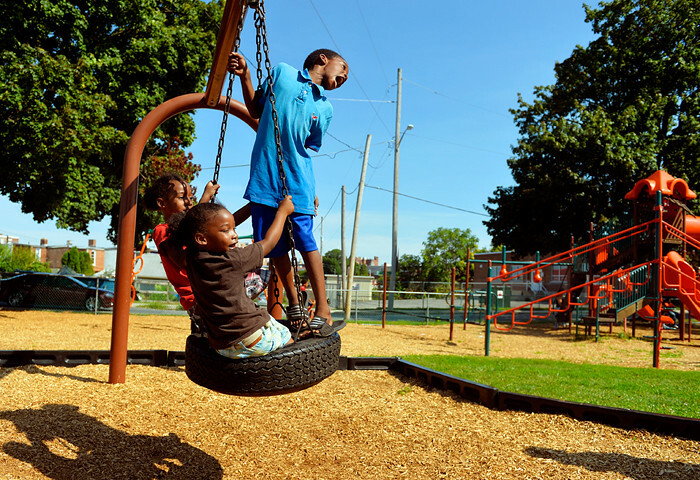 (Left to right) Brothers Zaire Kittrell, 7; Zayden Kittrell, 5; and Zyon Sweeney, 8, plead with their cousin Naquaj Sweeney, 14, for another push on the tire swing during Parkway Day 2014 at Williams Park in York on Saturday, Aug. 16, 2014. Parkway Day first began as a sort of block party for the neighborhood in 1984 and was held every year through 1996, followed by a reunion in 2001. Now the older generations who hosted the previous events hope the younger members of the neighborhood will carry the torch and continue the tradition of Parkway Day. © 2014 by The York Daily Record/Sunday News. 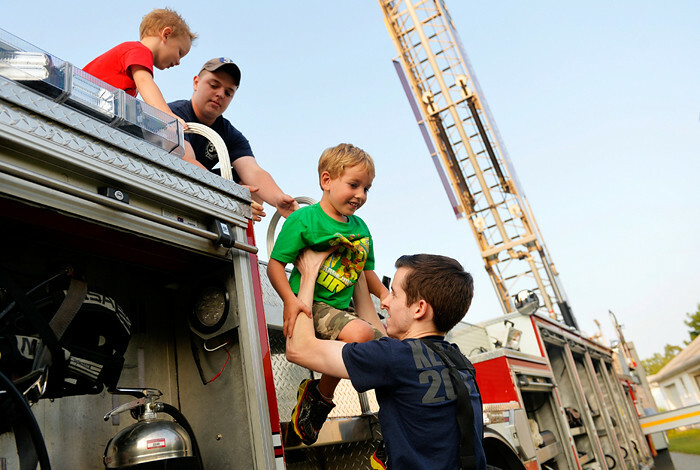 Red Lion Fire Company volunteers Jarred Miller, second from left, and Andrew Duarte, far right, help Lincoln Porta, 4 of Hellam Township, and Blake Kahler, 5 of York Township, down from the company’s ladder truck on Wednesday, July 30, 2014, at Grace Baptist Church’s Community Night in Windsor Township. Almost 10 firefighter, police or EMT units were represented at Grace Baptist Church’s first-ever Community Night, which was organized by fifth- and sixth-grade students at the church. The event took place in lieu of the regular Wednesday night service. © 2014 by The York Daily Record/Sunday News. 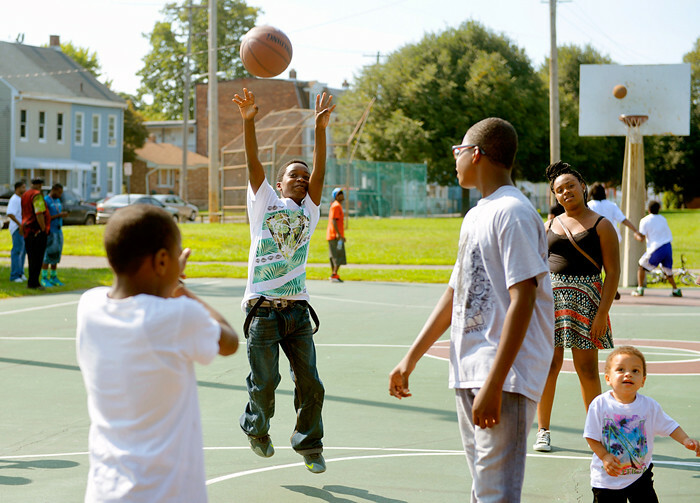 Nas Simms, 11, takes a shot at the basket during Parkway Day 2014 at Williams Park in York on Saturday, Aug. 16, 2014. © 2014 by The York Daily Record/Sunday News. 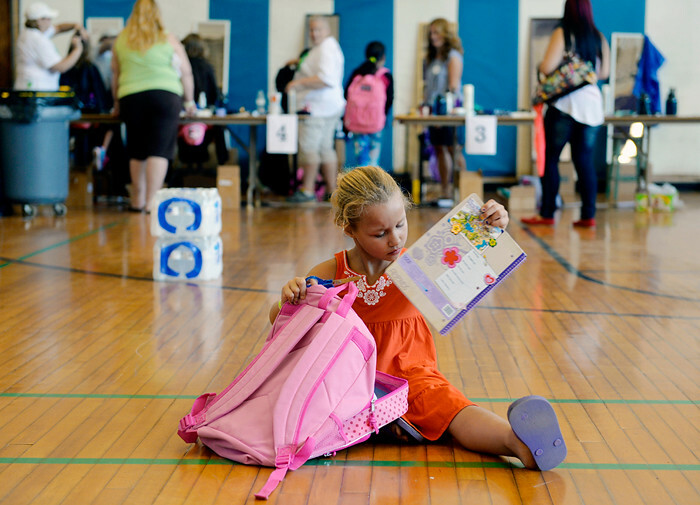 Ka’Liyah Redman, 6 of York, pulls out a notebook and other supplies that came in her new backpack at Project Big Love 717, a free back-to-school event that was the result of collaboration among Dillsburg-area churches, business and citizens, on Saturday, July 26, 2014, at Northern York High School. The project served about 500 special-needs persons by invitation only on Friday, and opened up to the public Saturday. As of 11 a.m. Saturday, about 1,500 people had come for free backpacks filled with school supplies, haircuts, sneakers, family pictures, groceries and lunch. © 2014 by The York Daily Record/Sunday News. New Hannah Penn students peer into the gymnasium during a back-to-school night at Hannah Penn K-8 School on Thursday, Aug. 14, 2014. 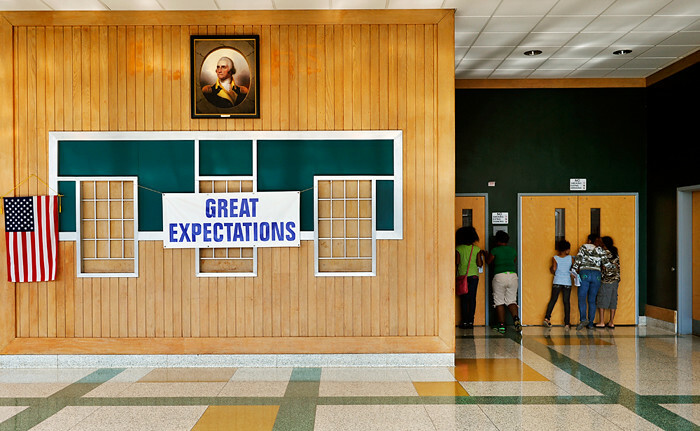 Hannah Penn was closed as a middle school at the end of the 2011-2012 school year, but is reopening as a K-8 school, to accommodate students who previously attended the now-closed New Hope Academy Charter School and to relieve overcrowding at other schools. © 2013 by The York Daily Record/Sunday News. William Penn’s Q’ajaniyah Miller drops into her teammates’ arms during the Bearcats’ routine in the 2013 YAIAA Cheerleading Championship on Saturday, March 16, 2013, at Dallastown Area Senior High School. William Penn took first place in the “small” division, while Central York won in the “large” division. Little did I know that Q’ajaniyah — whose name her teammates were unable to spell out for me — and I would cross paths again. The YAIAA would host yet another 2013 cheerleading championship that took place in the next school year, in December. Sports reporter Matt Goul was covering a William Penn basketball game later that day, and happened to be chatting with their scorekeeper, who was upset that the William Penn cheer squad had lost their division title by a mere half-point. The conversation then revealed that one of the cheerleaders had had a particularly rough year: Q’ajaniyah had been caught in some crossfire in June and struck through the hip, yet recovered in time to rejoin the squad in the fall. © 2014 by The York Daily Record/Sunday News. Q’ajaniyah Miller and other Tri Town Extreme cheerleaders run through a routine in the squad’s final practice of the year on Wednesday, April 2, 2014, at William Penn. Miller, 18 of York, has twice been the victim of gun violence: Her father, Ajani Miller, died via a gunshot in the pelvis in Dec. 1999, and she was caught in crossfire outside her house in June 2013. 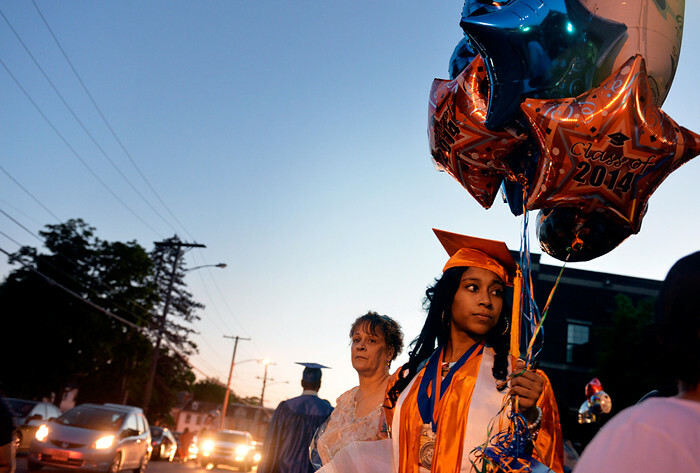 Newly graduated from William Penn Senior High School — where she was a cheerleader, class vice president and homecoming queen — and motivated by her brushes with gun violence, Miller is working to overcome financial and other issues in order to study criminal justice at The Pennsylvania State University this fall. Matt relayed this information to me in January or February, and mentioned he was interested in pursuing the story. I encouraged him to dig a little deeper and to include me in the coverage. The longer we worked on the story, the more we learned. We learned that Q’ajaniyah’s father had been shot and killed two days after Christmas 1999, when she was 3. © 2014 by The York Daily Record/Sunday News. 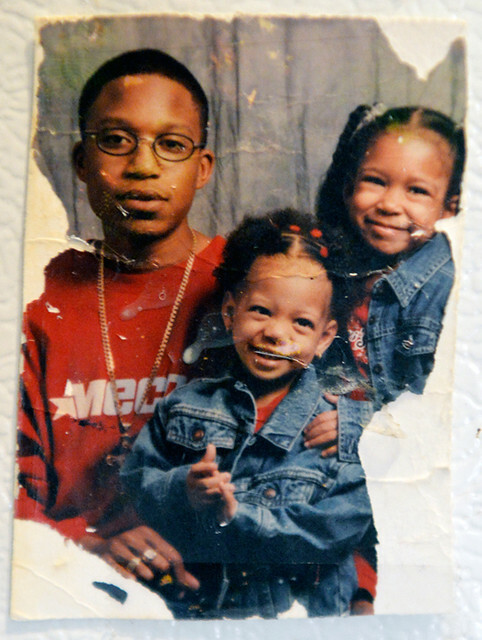 This picture of Ajani Miller, left, his daughter Q’ajaniyah, right, and Q’ajaniyah’s cousin was taken two weeks before Ajani Miller’s Dec. 27, 1999, death. The picture hangs on the refrigerator in Q’ajaniyah Miller’s West Princess Street home, and is the only one she has of her father. We learned that her mother moved them to Brooklyn two years later and studied to become a police officer, but another tragedy prompted their return to York. 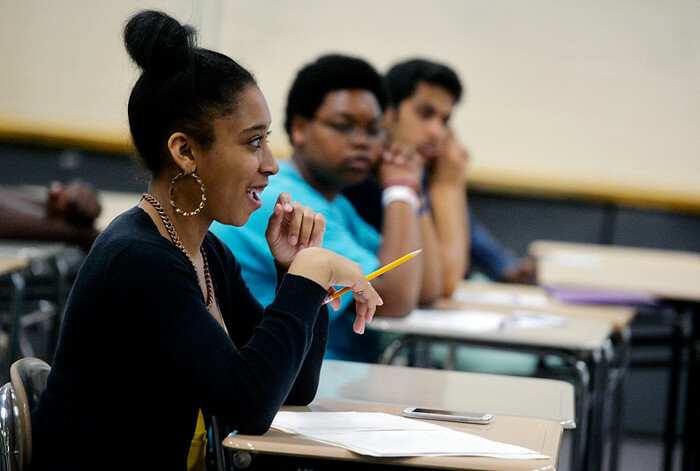 We learned that Q’ajaniyah, profoundly affected by her father’s death and perhaps influenced by sitting in on her mother’s law enforcement classes, was determined to go to college and study criminal justice. We learned that she is the oldest of her siblings — two brothers, ages 6 and 2, and a now 10-month-old sister — whom she helps care for, and for whom she strives to set a good example. © 2014 by The York Daily Record/Sunday News. 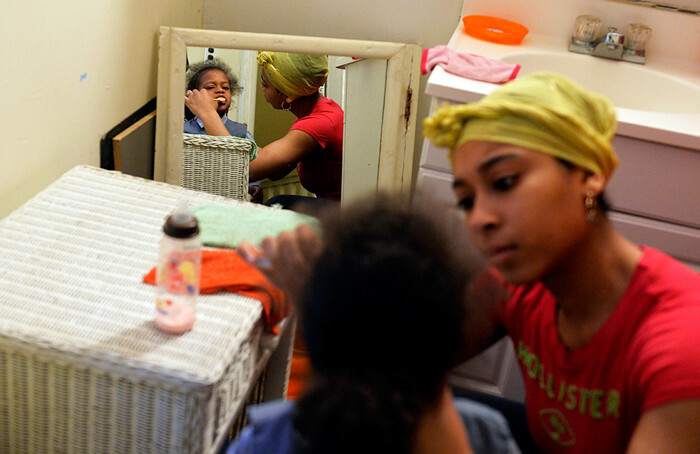 Q’ajaniyah Miller, 18, helps her brother Julius “Juju” Little, Jr., 2, brush his teeth before school in her family’s West Princess Street home on Wednesday, April 30, 2013. Q’ajaniyah, who is 12 years older than her oldest sibling, helps her mother, Ronielle Kirkland, care for her younger brothers and baby sister. We also learned that she found strength in cheerleading, where she made friends with other girls who had lost their fathers to gun violence. © 2014 by The York Daily Record/Sunday News. Q’ajaniyah Miller looks across the floor as she and other Tri Town Extreme cheerleaders stretch before the squad’s final practice of the year on Wednesday, April 2, 2014, at William Penn Senior High School. Over the course of several months, we worked with Q’ajaniyah, her mother and her friends, and incrementally learned new tidbits that would shape or completely change the story. The weeks before Q’ajaniyah’s graduation presented a tough time for all involved, as she wasn’t sure whether she could afford to go to Penn State and we weren’t certain how we should end the story. © 2014 by The York Daily Record/Sunday News. 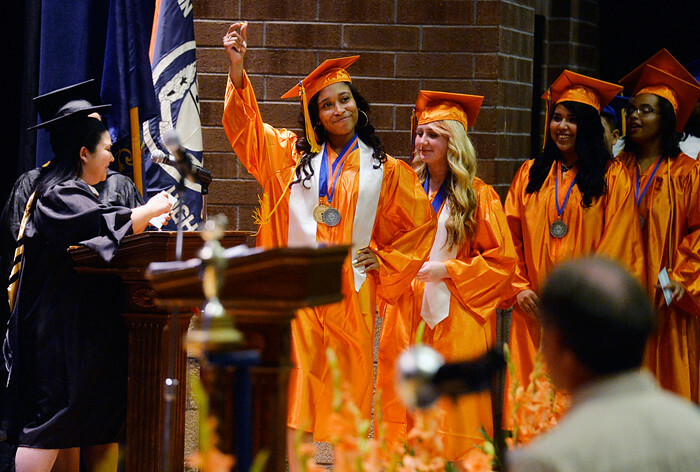 Q’ajaniyah Miller, 18, reacts after the announcer at William Penn’s commencement ceremony pronounced her full name correctly on Friday, June 6, 2014. She was named after her father, Ajani Miller, who was killed when she was 3. In the end, I’m grateful to Q’ajaniyah for opening up to us, and glad that we all put so much of ourselves into the story. And I’m excited for her as she starts classes at Penn State in the next few weeks, and I wish her all the best. © 2014 by The York Daily Record/Sunday News. Q’ajaniyah Miller, 18, stands with her grandmother Tina Maxfield while waiting for her mother, Ronielle Kirkland, to drive the minivan over after graduating from William Penn on Friday, June 6, 2014. Q’ajaniyah, who is enrolled to attend Penn State in State College in the fall, plans to spend this summer working on her tumbling and staying in shape for cheerleader tryouts. You can read Matt’s story here, and view many more pictures here.